Republic Act No. 10928 or a law to extend the validity of passports of Filipino citizens for up to 10 years was officially approved by President Duterte yesterday however; this bill will not occur for individuals under 18 years old. The initial longevity of Philippine passports was good for 5 years. The Department of Foreign Affairs (DFA) is the one that will implement the rules and regulations to ensure its provisions. They are also task to improve their passport processing system for a convenient service for Filipinos. The new law will take effect 15 days after it will be publicize in several newspapers. The reasons for this extension are to lessen the burden of Overseas Filipino Workers in renewing their passports every 5 years and to make their travel much easier. Aside from the extension for passports, Duterte also signed the Republic Act 10930 that will lengthen the validity of driver’s license from 3 years to 5 years. 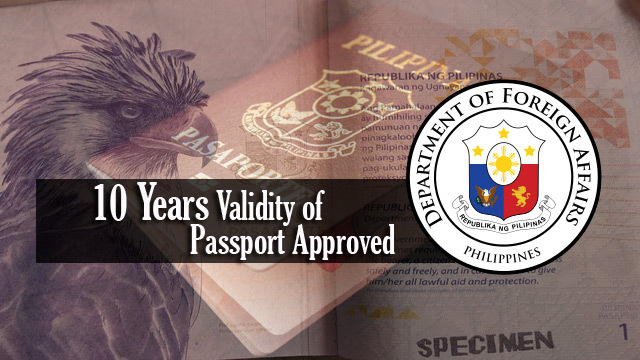 When news broke out that the President finally sign the new Philippine Passport Bill last Wednesday morning, many Filipino netizens especially OFW’s were happy that the country is one step closer in having 10-year passport validity. The House of Representatives and The Senate just need to congregate a bicameral conference committee to deliberate the differences between House Bill 4767 and RA 10928. One of them is a netizen with a username Nagagalitna said that it will be better if the passport will reach 200 pages because workers at an oil and gas industry need more pages for they travel a lot. Jen_Luna also express her happiness by saying that it’s another right step. She’s hoping that it will implement well and it’s about time that every Juans can benefit not just the elites. Philippine Consulate General Paul Raymund Cortes revealed to the media that they are just waiting the instruction from the office for the timetable, schedule and how it will work.